Orange red tailored pencil dress by ASOS Collection. Featuring a boat neckline, slim, elbow-length sleeves, darts to the bodice, a fitted waist, pin-tuck pleats to the skirt and a draped cowl back to reverse. Designed with a tailored fit and a mini length. 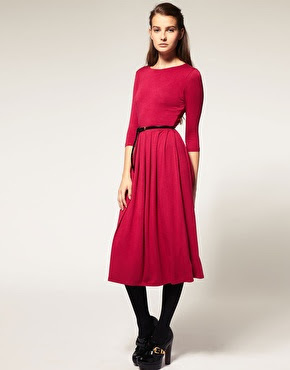 Sangria pink midi dress with three quarter length sleeves, featuring round neckline, slim fit to the top, pleat detailing below the waistband, and a full pleated skirt, in a stretch jersey fabric. Purple mini dress by Aqua. Featuring a bandeau neckline, high fitted waist with a folded peplum and form fitting skirt, a concealed zip closure and kick split to reverse. Platform loafers by ASOS Collection. Crafted in pure leather with a snake effect finish. Featuring a high cut vamp with tassel detail across the front, a square cut toe, a concealed platform sole and a high block heel. But can I justify buying these when I have these electric blue snakeskin heels? Hmm. Prefer the first dress - don't think you'd have many 'librarian' days! The heavy decision re the shoes rests on your shoulders!